The Centre for Interactive Research on Sustainability (CIRS) is a regenerative building that houses an ambitious program to contribute directly to accelerating sustainability on the ground. It is intended to be at the front edge of sustainable performance, demonstrating leading edge research on sustainable design practices, products, systems and policies. 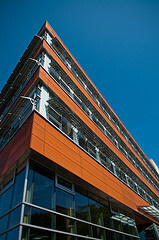 It is the home of the UBC Sustainability Initiative (http://www.cirs.ubc.ca). The goal of CIRS is to accelerate sustainability in building, urban design and urban policy in British Columbia. The CIRS approach to achieving that goal is intended to be innovative in two respects. First, it contributes to research and practice on building design, simulation and visualization for community engagement research, and policy analysis by building a living laboratory of sustainable building practice. Second, CIRS contributes to policy development and the commercialization of these and other sustainability practices through partnership between researchers, practitioners, and end users that will move the fruits of research more directly and effectively into the policy and business decision- making arenas. In so doing, CIRS provides bridges between the technological and the behavioural advances necessary in any transition to sustainable patterns of living. CIRS is a hub for sustainability research and action in the region, providing a common environment where academic researchers and non-academic partners can collaborate to develop innovative solutions to sustainability challenges. CIRS is also a demonstration and education centre where members of the public can see sustainability technologies and practices in use, take part in sustainability education programs, and participate in community engagement and planning activities. Upon opening in 2011, CIRS is the most innovative and high-performance building in North America, from the point of view of sustainability. The CIRS facility itself is a laboratory for research on sustainable building technologies and practices. The site and its component systems are research infrastructure. It is designed to perform at the frontier of sustainable building systems – radically reducing emissions, materials consumption, energy use and water use. A key goal is to live within the building footprint as much as possible: a substantial portion of the building’s electricity and lighting, most of the energy needed to heat water, and all of the water supply and liquid waste treatment come from the sun and rain that shines on and falls on the site. Much of the building is naturally ventilated and all of the energy required to provide the building’s space heating needs is recovered from an adjacent building currently venting waste heat into the atmosphere. From 2001-13, I was the Director of CIRS. Its design, construction and operation represented the culmination of many years work, and now offers the opportunity to use the whole building as a research instrument in the human and environmental dimensions of building scale sustainability.